In the Early Silurian, during an episode of uplift and mountain building, streams flowed northwestward across northern New Jersey, depositing thick sequences of river deposits ranging from quartz pebble conglomerates to fine mudstones. Following this uplift, the sea moved in and out over northwestern New Jersey for some time. Fragments of eurypterids (“sea scorpions”) and traces of trilobites have been found in rocks between terrestrial sediments. 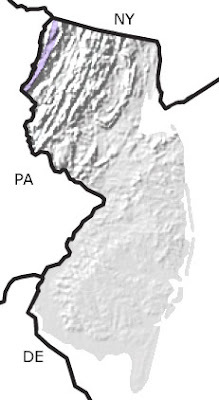 In the Delaware Water Gap area, fossils of ostracoderms (early fish) have also been found. Shallow seas returned to New Jersey during the Late Silurian, as evidenced by fossils of a diverse marine fauna including, corals, crinoids, brachiopods, bryozoans, and trilobites. 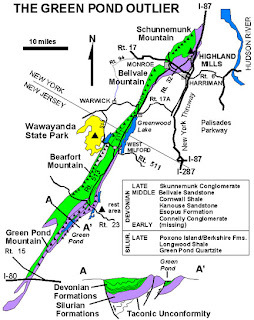 This map indicates an exposure of Silurian rocks in northwestern New Jersey. 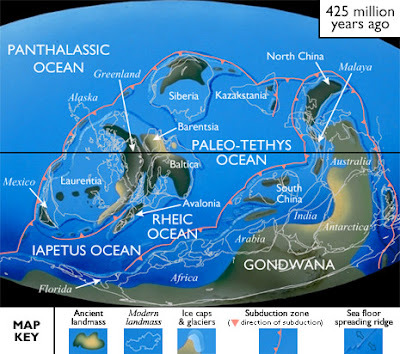 North American Paleogeography: A shallow sea covered much of North America during the Silurian, except for its southern margin (now the East Coast), which was being uplifted. The uplift began as a collision with an island arc in the Ordovician and developed into a collision with the continent of Avalonia by the end of the Silurian. In the shallow sea, limestone's, shale's, and sandstones were deposited, and many large reefs developed.